a hundred in a canoe and you are already a child of nature. When I was ten, my cabin group at YMCA Camp St. Croix set out on what ranked then—and may still rank—as the longest canoe trip ever undertaken by the camp's trip program. In eight days we paddled 360 miles from Hudson, Wisconsin down the St. Croix and then the mighty Mississippi to East Dubuque, Illinois. 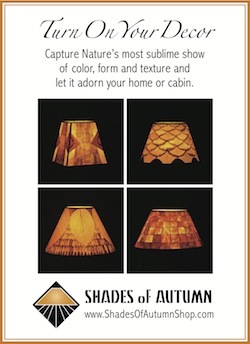 particularly quiet and beautiful stretch of the St. Croix further north. But the long Mississippi trip was the first time I'd learn the finer points of this, the most serene of water craft. Those eight days, for a ten-year-old, might as well have been a trans-continental expedition for all I learned about buoyancy, balance, wind, waves, currents and navigation, not to mention the capacity of my own body and spirit. and paddling than I do walking on dry land. I've had my own canoe for 35 years. It's a Mansfield Osprey, a thirteen-foot wood-and-fiberglass fishing model made by the Stowe Canoe Company in Vermont back in the early 1970's. In the thousands of hours and miles I've spent in that sweet craft, much of it paddling solo, we've gotten to know each other very well. This newer model of my Osprey has a portage yoke. While I'm far from a competitive paddler, that canoe's taught me how to turn on a dime, go forward and backward, even sideways. I can paddle with barely a sound; wild critters walk away from me instead of bolting in terror. I can flip her up onto my shoulders, where her center thwart sits so lightly that I don't even need a yoke. I can honestly say I feel more comfortable sitting on that cane seat and paddling than I do walking on dry land. The balance, the control, the movements have all become second nature to me. What other craft can you carry for a mile or more and plop down in waters otherwise inaccessible? Which will let you glide through places barely two inches deep? Does any let you drift silently, close enough to birds, animals and fish to practically touch them? Is there another transport that offers a more fair and honest exchange of your energy for movement, one which treads more lightly and leaves no trace of your presence when you leave? Swirly footprints mark her passage, then congeal back into glassy reflection. If waterways are Nature's arteries, my canoe lets me feel their pulse. Their waves rock me—sometimes a bit too roughly; their upcurrents and eddies lift and turn me; their temperature seeps through the thin ash ribs so I can feel the cold and warm spots on my feet. And then there's the sheer beauty and grace of a canoe. Those sumptuous curves, converging at the apexes of bow and stern. The way it gently parts the waves, presses them down and then releases them. Swirly footprints mark her passage, then congeal back into glassy reflection. I've always preferred wooden canoes—or at least partially wooden. Aluminum canoes, though durable, are cold, noisy and heavy. Kevlar canoes are light, but their translucence is unnerving. The material's extremely tough for its weight—but only against impact, not abrasion. It can practically stop a cannon ball, but running it up on a gravel beach a few times will bring it to its knees. Paddling a wooden canoe is like sitting inside a piece of fine furniture, one that transports you both physically and esthetically. Because much of its material comes from Nature, I always feel like a wooden canoe belongs in Nature. In touch with the water, open to the sky, quiet as a breeze, I feel my surroundings embrace me—and I them. More than any other thing or place in my life, my little Osprey bonds me with Nature, reminding me not just where I truly belong, but who I really am. I enjoyed reading this Jeffrey. The James River runs near here and when I decide it's time to take to the waterways there may be an Osprey there as well. Thanks for dropping by, David! I looke up some pix of the James (Virgina, right?) It looks similar in size & moderate wildness as our St. Croix. Happy paddling! I too know canoes inside and out. I grew up in them as we lived on a lake. I really related to how you said you feel more at home in a canoe than with your feet on dry land. I even have beautiful dreams of being in the canoe. I so related to this post, the silent paddling, the movement, the sounds. 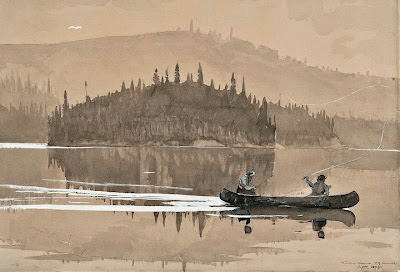 When I lived up near Baxter State Park in Maine, I used to take my canoe out to the "dead waters" where all the moose were feeding. Moose don't have really great eyesight, and as long as you move directly toward them, head on, they have trouble telling that you are getting closer to them....not until you are almost on top of them (or if you move sideways) do they "get it". LOL! :) In fact, one has to be careful doing this because these very large animals can panic and step into the canoe. Some of the bull moose are HUGE. But I could paddle so quietly that I would often see 6 - 10 moose in an evening. Lots of deer, herons, beavers, ducks, loons, etc. 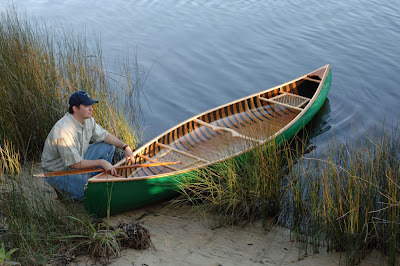 All because the canoe could handle reeds, shallow water, and so do quietly, stealthily. :) And one never really needs take their paddle out of the water. I adore canoes. They are an extension of my body, my soul. It is really is an unforgettable relationship. You wrote about this part of yourself so beautifully. It was like you were writing for me, about me. Your love of the wild is SOOOOOOOOOO good for me. You inspire me, and constantly remind me who I really am. PS: I also appreciated you comparing canoes as I want to get one. I've used all kinds...so we'll see. Hi Robin -- Once again you're so generous with your praise that I feel undeserving. Thank you! You've told me of your love for canoes and canoeing. How nice that we share that too! I'm sure that, as my old canoe did with me, the right one will waltz into your life when you're ready!